Disney Babies Blog: About Me Monday - Veterans Day! I've decided I'm going to use Monday's as non-Disney ME time. And being that yesterday was Veterans Day (and I was working.. as I've been every day for the past 3 weeks) I decided to share a little more about my unique job today! As I've mentioned - I recently spent just under 2 weeks in China for work. It was an amazing and unique opportunity and I LOVED it! I was hesitant for so many reasons - leaving a 6 month old as a nursing mom is hard on SO many levels, but I knew it was a once in a lifetime opportunity... plus, I'm active duty military and saying no doesn't actually have much clout. We reached out on an artistic level to show friendship and cooperation and I enjoyed getting to know those around me - their English is much better than my Chinese, though I can order soup dumplings (Xiao Long Bao) with the best of them! Our two military bands have a great connection now and I can only hope that we will be able to perform with them again. 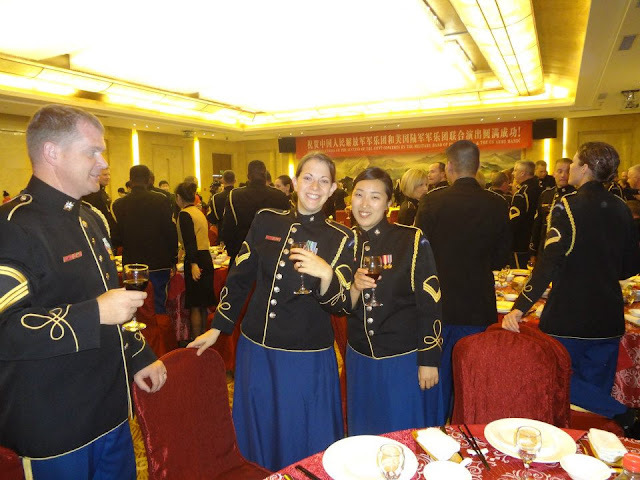 Here's a pic of me and some coworkers at a banquet hosted by the People's Liberation Army Band for us on our final day in Nanjing, the old capitol of China. Since we've been back, we performed all weekend for Veterans Day - two concerts to 2 large crowds, honoring and celebrating. I hope you were able to enjoy as well!